100%cotton, which means it is no harm to people,and very soft and absorbent. we have many beautiful designs,we can make a customize for you. Qualihub textile Co., ltd (Former name----- Rudong huayuan dyed textile factory)located in Nantong city ,which just 120 kilometers away from shanghai, it is very convenient in transportation. 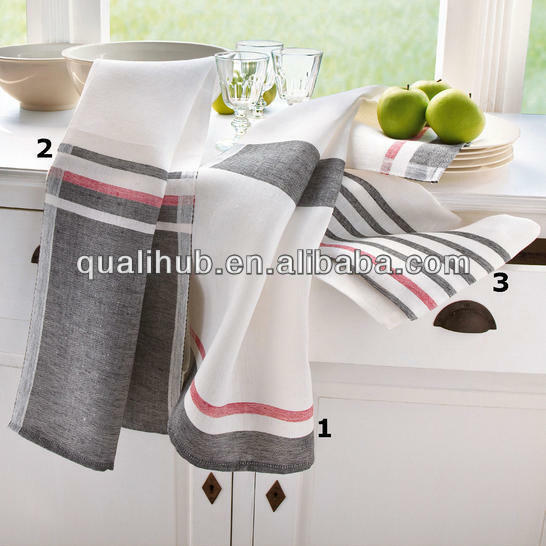 Qualihub textile Co. ,ltd is a professional manufacture of clothing fabric and home textile products in kitchen and other filed. We have a team engaged in design,manufacture,and sale over 15years. Many of them have decades of experience in this line. Our company has been adhering to the enterprise philosophy of "quality-oriented, honest first". and guarantee to offer high quality products. Our products passed the inspection appraisal by Williams-Sonowa,Lifeng ltd,otto international ,they are good sellers in all of the world. Our products include clothing fabric and woven towels ,such as yarn-dyed tea towels,embroidered tea towel , printing tea towels, jacquard tea towels, velour towels, face towels,bath towels ,golf towels, towel robes, microwave oven gloves, tea mats ,baby stuff and other related products. We also can customise those products as your demand. We sincerely hope to cooperate with you. If you are interested in any of our products, please feel free to contact us. We are looking forward to establishing business relationship with you.